The Mongoose 90S offers parents variably controlled speed settings for maximum confidence and instant adventures for the young guns. A youth-sized sporting ATV with moderating parental control, the KYMCO Mongoose 90S is a slick sport-quad with credentials for beginners. 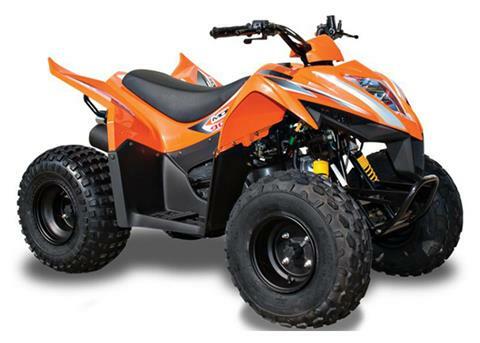 Powered by an air-cooled, carbureted 89cc, 4-stroke engine, and operated via an automatic CVT with F-N-R, the chain-drive Mongoose 90S features single a-arm front suspension and a single swingarm rear suspension. Tires are 18 x 7-8 front/18 x 9-8 rear, and braking is by front drum and a rear disc with safety lock. It futures an electric start and auto-stop safety lanyard kill-switch, screw-type throttle limiter, and CVT collar that allows speed and power limits to be set. Available in Black or Orange. ANSI/SVIA Rated Y10 – The Mongoose 90S is recommended for riders 10 years of age and older. Mongoose 90S riders younger than 16 years of age must be supervised by an adult, and all ATV riders should take a training course.